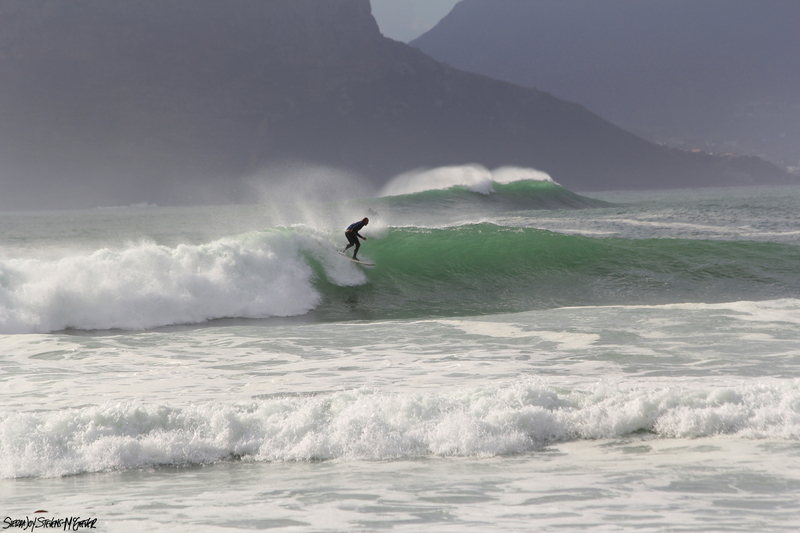 Dave and I left our hotel with no expectations, heading south to Muizenberg, a quiet surf town on False Bay. From the steel blue edge of the ocean the topography ascends exponentially. Gradually at first, the land rises to yellow sand, then a green slope dotted with white buildings. Above the last well-cared for wooden houses perched in clusters, the slope erects into the cliff face of the flat topped mountains. The entire picture was reminiscent of central California—the rocky coast, quiet seaside towns and coastal mountains—but the scale had shifted, the mountains stood closer and taller, their prominence undeniable. Dave pulled off the freeway at boulder’s beach. We followed signs to a large parking lot. 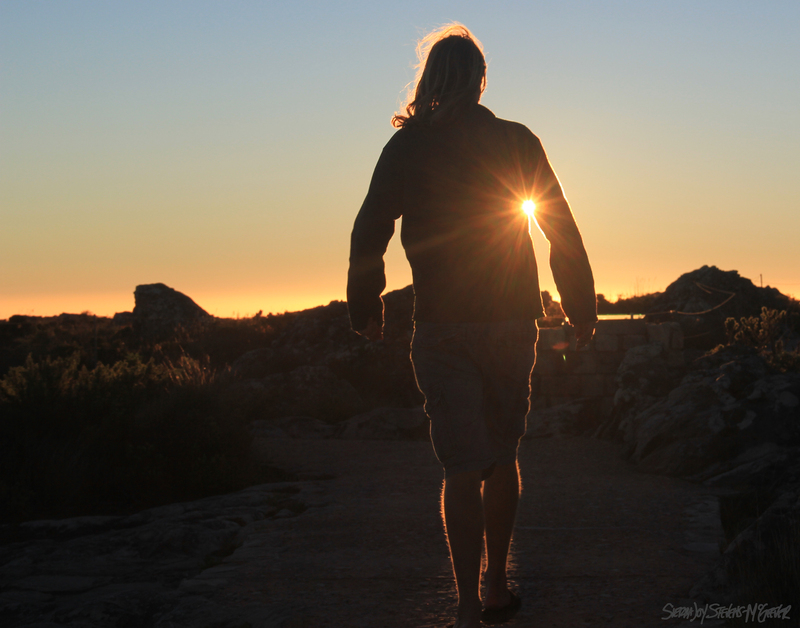 A middle-aged man with sandy hair, partially dreaded, partially free flowing, approached our car with a broad smile. I’ll watch your car, he said nodding. Dave smiled hesitantly and retuned the nod. With experience we learned that, at least in the southern part of South Africa, the poor, homeless and young will stand in busy parking lots and watch over the cars in exchange for a small tip. A boardwalk took us over lightly vegetated dunes. 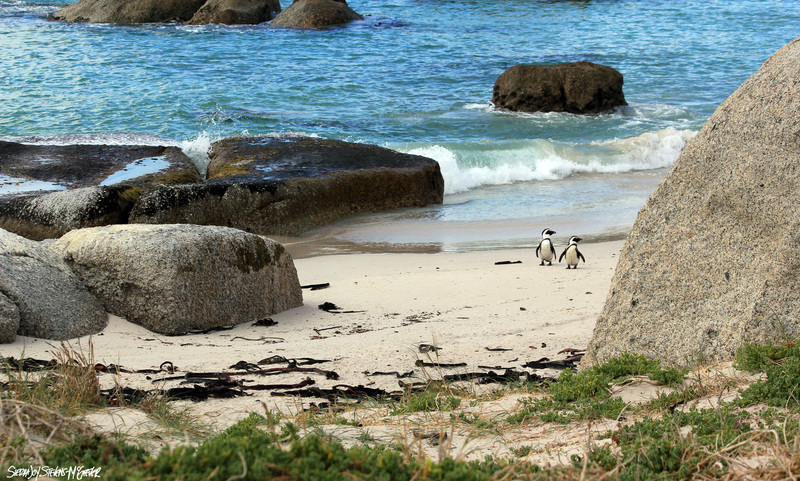 African penguins peered out from divots in the sand with increasing density as we neared the water’s lapping edge. Just slightly over two feet tall and dressed in the full tuxedo with black masks and pink patches above the eye , three adults ambled on short legs towards the water, wings held stiffly just off their sides. The sea’s edge was placid, transparent turquoise. The penguins tottered into the water, transitioned effortlessly to their bellies and swam swiftly off, likely in search of sardine, mackerel or other small fish to bring back to the waiting youngsters. Many more adults clustered by their chicks on the beach, where they grouped in kelp-lined nests, just above the high tide line . The younger chicks were brown with creamy bellies, fluffy and adorable. Adults preferentially occupied nests with these babies, still needing the warmth and protection of a parent. As the chicks age, their non-waterproof down is sequentially replaced with feathers—bristling new blue and silver plumage  coated in tufts of unkempt fuzz. The last of the down on many of youngsters was a wide swath around their necks, like a moth-eaten scarf, sad and worn out. These teenagers, like teens of many species, are awkward and cute in their ugliness, as if struck with a blue mange. They grouped together in crèches, piled in heaps for warmth or stood close preening their mismatched feathers. 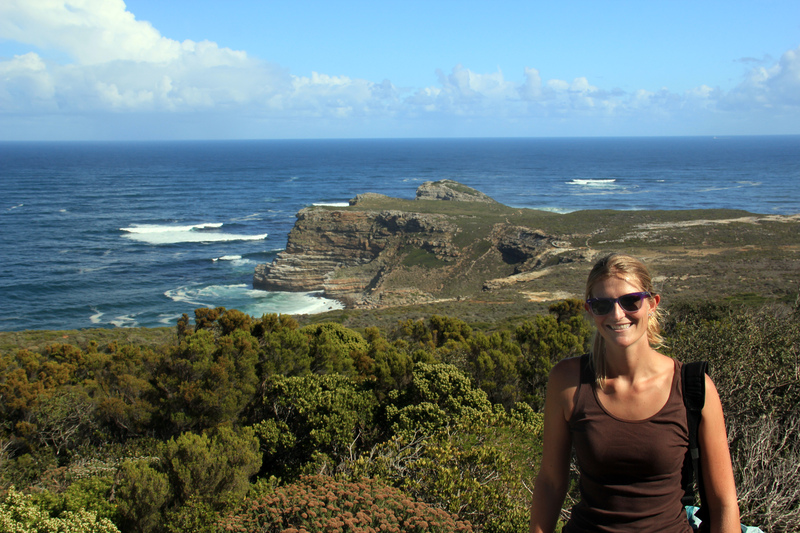 The waves between Cape of Good Hope and Cape Point were massive, rolling in from the great blue, standing up as giant jumbled faces and crashing ferociously into the rocks on shore. Cape Point rose on tall cracked walls, and provided astounding views of the jumbled meeting of the Indian and the Atlantic. Neatly crafted stonewalls lined scenic paths connecting overlooks. The air jostled with the sounds of multiple languages. Young kids bounded up the slopes in front of their parents. Elderly travelers slowly ambled to the top. A crisp wind blew short bits of hair out of my messy bun and around my face. 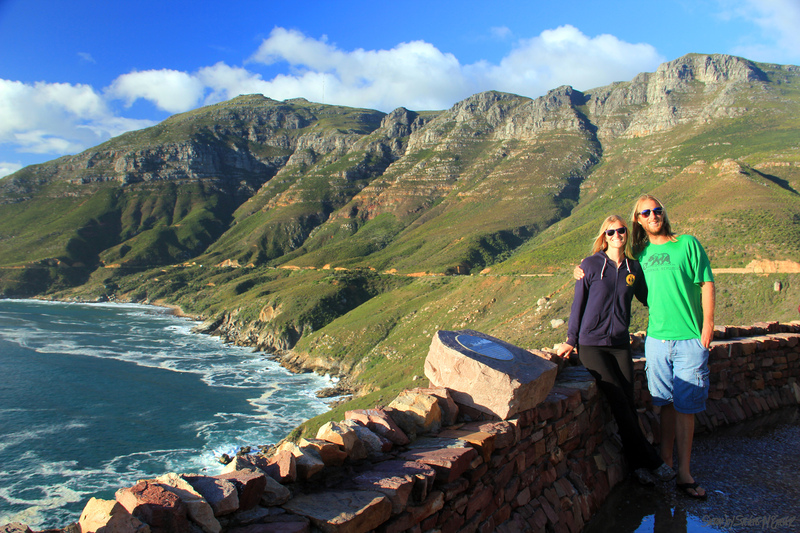 From atop the point we looked, directly below us at the water and behind us, back towards Cape Town, over the chaparral landscape, scrubby bushes rolling into the ocean. Antelope of some sort grazed in the distance, barely distinguishable brown bodies near a cluster of bushes that burst with brilliant yellow flowers. 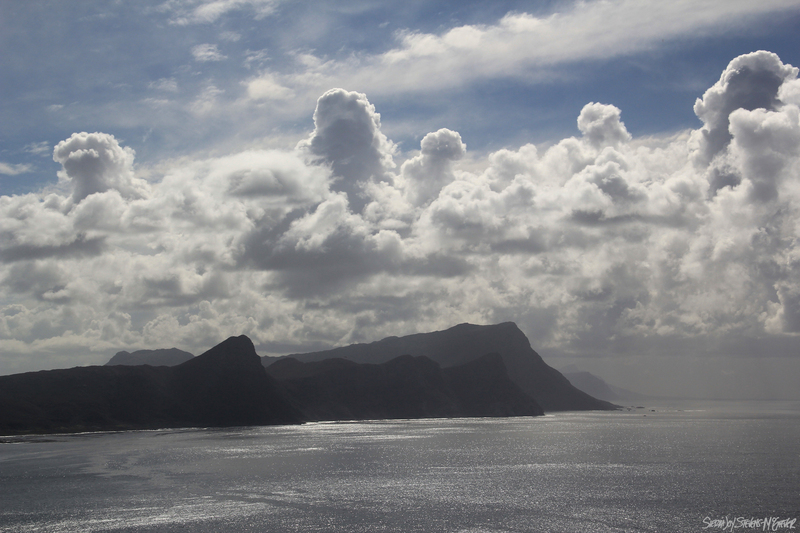 Looking back toward Muizenberg, we ate lunch and admired the steep flat-topped mountains rising quickly from the silver water in overlapping dark silhouettes lightening progressively as they receded. The water was a deep silver dotted by light patches of reflection from dancing sunrays. Overhead the sky was blue and filled with warmth, and in the distance cumulus clouds billowed high and darkened. 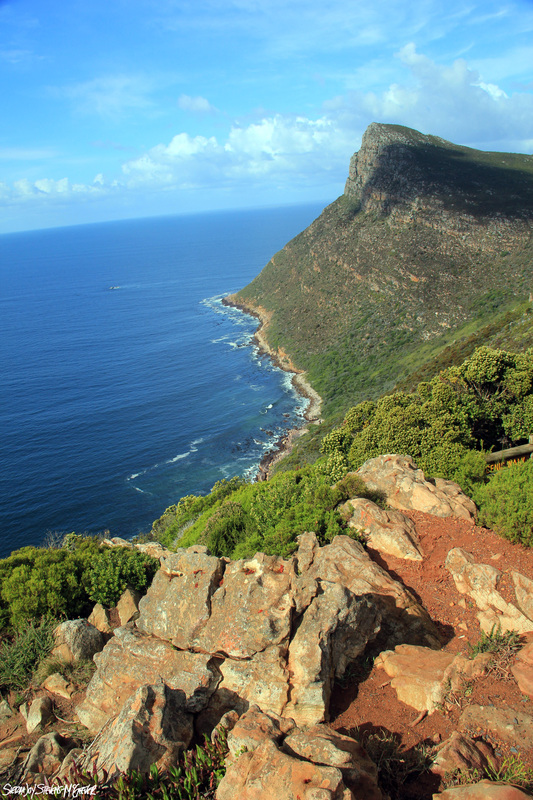 The Cape of Good Hope, an outcrop of sedimentary rock, stood green topped and well sculptured. A zoo of tourists surrounded a sign reading the location’s name, eager to photograph themselves with this place on the map. We steered towards the rocky beach to avoid the crowd and enjoy the scenery. Familiar ice plant grew above the high tide line and dark kelp cast a lacy veil in the surf. 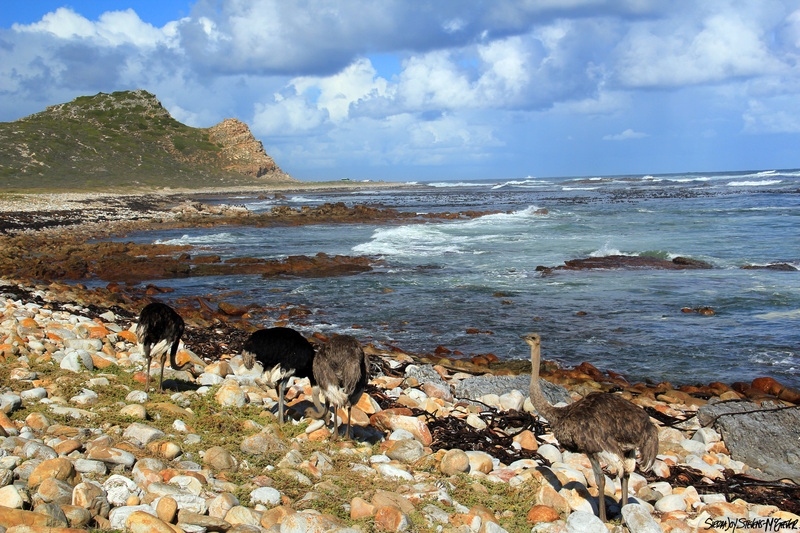 A group of ostriches, tall and awkward, picked through the seaweed piles and grass, feeding between the rounded white, cream and orange boulders. With the click of my camera, the large male, with his distinct black plumage, turned a bright eye , ringed with long lashes, at me. His behavior indicated that he was the dominant male, keeping an eye out for the safety of his flock . Once content I was not a threat, he resumed foraging. I inched closer, peering through the viewfinder of my camera, telephoto lens fully extended to 300mm. A fleshy piece of foliage was plucked by the quick beak of one of the females, it lingered in the air for a second then disappeared into her open mouth . The viewfinder brought me closer, capable of observing and capturing intimate details lost to the naked eye observing from afar. “I think we should go.” Dave was impetuous, itching to get in the water, keenly aware of our limited time, whereas I was lost in the moment, absorbed in the here and now. “Uh, Sierra…” I looked up from the narrow window of my camera and found that the large male was noticeably closer and walking deliberately with slow long strides, wings raised slightly. He blinked in the bright sun, dipped his long, graceful neck, nabbed a lizard and swallowed it whole before taking another step in my direction. The closer he came the more impressive he became, rising before me to his full nine feet in height. I backed up slowly, acutely aware that he could reach me in just a few giant ostrich strides  if he wanted, and that I was no match for a bird that can kill a lion with one swift kick from the long claws of its two-towed feet. On the way up the other side of the cape, towards the surf mecca around Kommetjie, a family of baboons stopped us, sitting by the side of the road feasting on pinecones. We did the tourist thing, and parked in the middle of the road. With massive canines, they crunched entrance to the prized nuts that were removed carefully with dexterous black fingers. Their gray coats contrasted sharply with the sunburned shade of their lumpy, bare butts . Signs everywhere in the area warn that ‘Baboons are dangerous wild animals and should not be fed by humans’. Dave feels that they are his brethren. It was not the last time he drew jovial identification between himself and the monkeys and great apes of Africa, pointing out similarities with a broad smile, eyes crinkling at the sides. 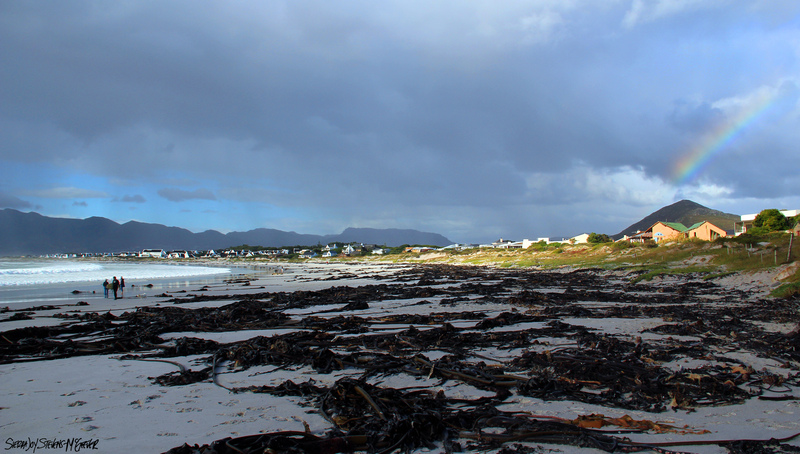 Kommetjie is about as picturesque as you could ask a seaside town to be. Well-fashioned white buildings sit neatly along the coast. The land rises slowly into curved hills and then prominent mountains. A long beach curves along the rim of a wide mouth bay, broad, flat and littered with seaweed. Mountainous silhouettes backdrop the water on the far side of the bay. Today, the surf was big. All along the curving beach, waves rumbled into the sand. Surfers were towing into a peaking wave, far out in the center of the bay. Dave joined the locals running out into the barreling waves along the beach. I walked perhaps a quarter of the length of the kelp-covered beach. The kelp rose in piles contrasting with the fine light sand—it looked like a giant cousin of the bull kelp back home, thick and formidable , adapted to high wave energy environments with griping holdfasts. The flexible hollow stipes, twenty to thirty feet long, gradually increased in width and ended with a large rounded float, from which supple fronds grew from the middle as if all clustered in a top pony tail . It began to rain. I situated myself on a rock and took cover under my umbrella, and enjoyed the storm. Robust droplets collided with the sand creating small craters and splashed from my umbrella with gaiety and nostalgia, transitioning once again from air to land. As the dark clouds moved around the mountains on the other side of the bay, blue sky retuned overhead. The sunrays filtered through a break in the clouds and separated into heavenly beams, casting a blinding sparkle on the water. From behind the perfect white town, a rainbow rose over the hillside and stretched up in the familiar arch. The drive north had more surprises in store for us. 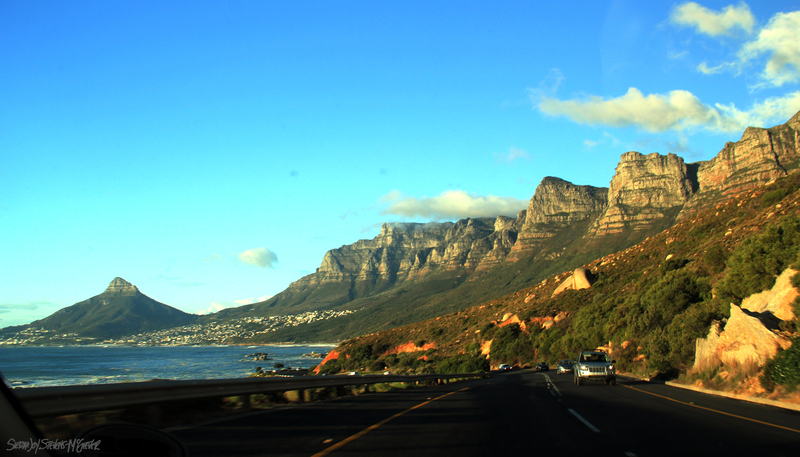 By Chapman’s peak, the narrow road around the mountain was carved into the steep face, in places shaded by overhanging rock. Like California’s highway 1, the road hugs the coast offering more astonishing views with every turn, exposed ancient marine sediments oxidized to a perfect red and carved by erosional artists over millennia. These views changed as we rounded a corner. The red cliffs were exchanged for green slopes topped with outcropping grey rock, neatly layered, and carved into prominent beings overlooking the vibrant waters below. 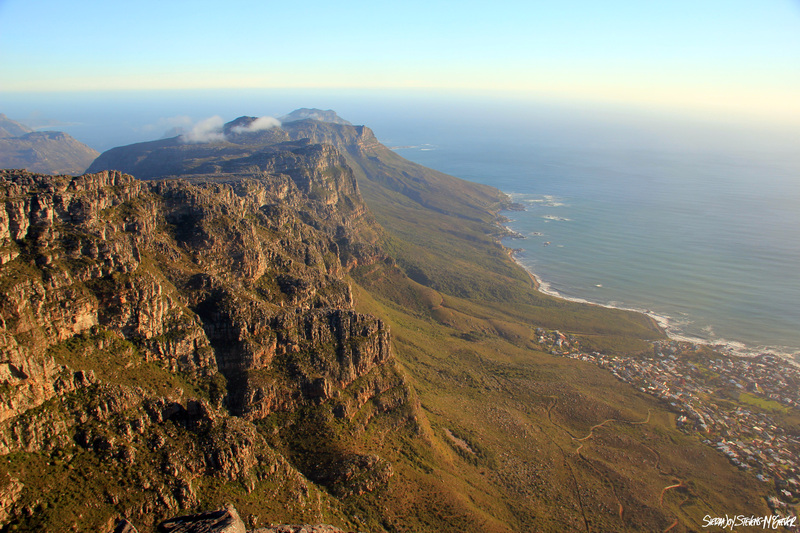 The twelve apostles of Table Mountain, cast in the golden light of the approaching sunset. We gazed up in silence. The next day we caught the evening cable car up to the top of Table Mountain. From the top, the exponential nature of the mountain is more visceral: the cracked gray sandstone plummets hurriedly into green slopes, which appear to slide easily into the ocean, textured with lateral lines of the incoming swell. 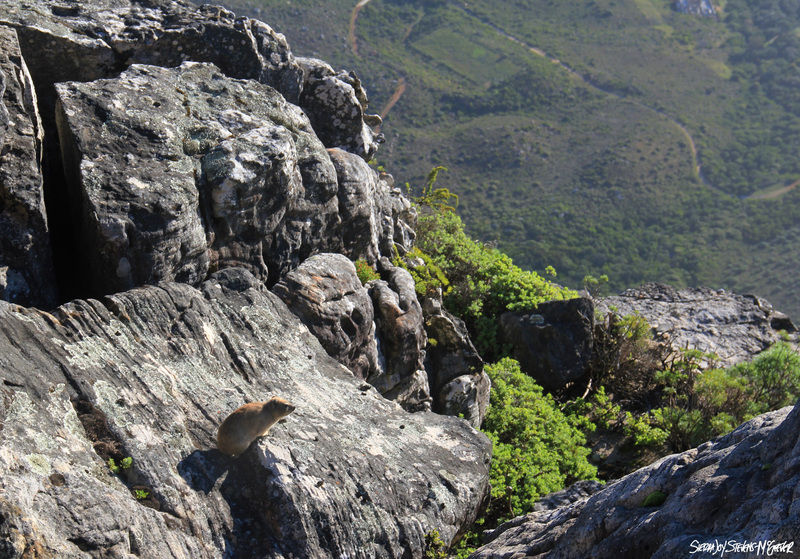 A cape hyrax scurried amongst the rock with exceeding confidence, unfazed by the elevation change, whiskers twitching with the sniffing movements of its pointed snout . The light is again golden, magically enhancing the views with a soft glow and the encroaching colors of sunset. Below us the city of Cape Town began to twinkle with the lights of the awaiting night. The land is so familiar in the ways it is reminiscent of California; yet it is foreign, alien and unmistakably African, and I am in Love. 1. The pink patches above the penguin’s eyes are glands used for thermoregulation. When the penguin is hot more blood is sent to this area to be cooled by the ambient air. 2. African penguins nest in divots they dig in the sand or in holes by plant roots, or more recently in artificial nest boxes. Pairs are monogamous through the breeding season and 80-90% will breed for multiple years often returning to the same breeding colony and even the same nest. African penguins are listed as endangered with a 90% population reduction in the last 100 years. Causes for decline include habitat destruction, oil spills and overfishing by commercial fisheries. 3. African penguin chicks fledge after 60-130 days (depending on food availability). Juveniles will then go to sea to forage for the next 12-22 months before returning to molt into their adult, black and white plumage. 4. Ostriches have the largest eye of any land animal. The eyeball diameter can reach 2 inches and is larger than their brains. 5. 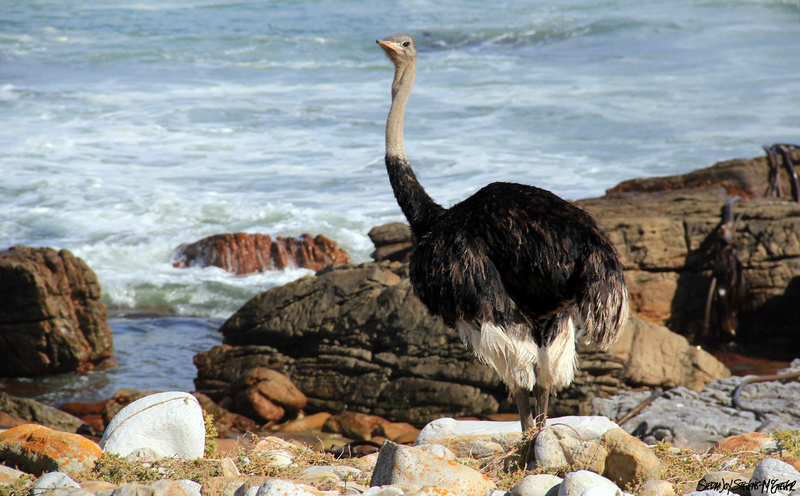 Ostriches are social birds, living in flocks with a distinct pecking order. The dominant male defends a territory and mates with the females. Eggs are laid in a communal nest but the eggs of the dominant female, or ‘main hen,’ are laid in the center of the nest where hatching success is the highest. 6. Birds have two stomachs. The first, the proventriculus, secretes highly acidic acid for breaking down fleshy food that was swallowed whole—fruits, fish, rodents, etc. The second, the gizzard, is highly muscular and is used to grind and digest tough food such as nuts and seeds. Birds will swallow sand and small rocks that accumulate in the gizzard and help grind the food into digestible pieces. The relative size of each stomach varies between species and can change seasonally in an individual with shifting diets. 7. The stride of an ostrich is between 10 and 16 feet. They hold the record for the fastest two-legged runner, reaching and maintaining speeds over 40 miles per hour. 8. 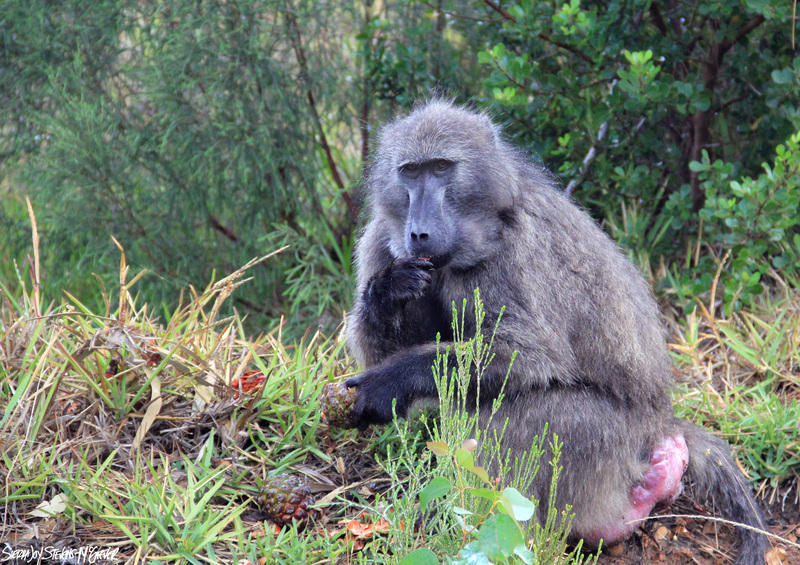 Baboon’s bottoms are comprised of nerveless callouses, an adaptation that allows them to sit comfortably for long periods. 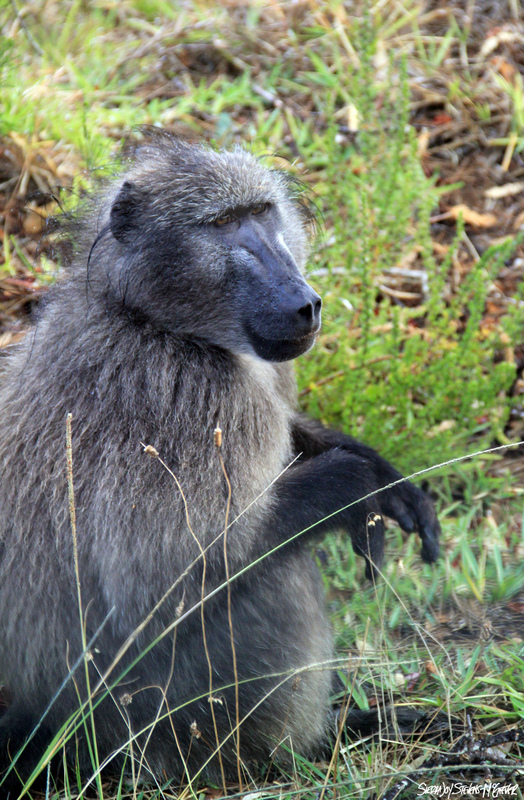 The ridges are thought to keep baboons secure on thin branches where they rest at night, away from predators. Female’s butts swell and redden when they are ready to mate. Scientists have found recently that the degree of swelling is a good indication of the female’s fertility. The ‘high swelling’ females reproduce younger, reproduce more frequently, produce more offspring and have offspring with increased survival rates. Consequently males spend more time grooming these females and fight more fiercely with each other for a chance to mate with them. 9. I later found out the sepcies was Ecklonia maxima, commonly called sea bamboo and although it similar in structure to the bull kelp, Nereocystis luetkeana, commonly found along the west coast of the United states, they are not closely related. 10. Though they take multiple forms, most kelp (brown algae in the order Laminariales) has four basic parts. 1. The hold fast at the bottom looks like the roots of a plant but instead of nutrient uptake, its purpose is simply to keep the kelp from being carried away by the current. 2. The stipe is the flexible ‘stem’ of the kelp from which 3. blades or fronds, the leaf like structures originate. Flexibility is key, allowing the kelp to move with surge and current instead of breaking. 4. Most kelp has a ‘float’ or ‘pneumatocyst,’ a gas filled bladder which floats the kelp towards the surface and the sunlight. 11. The hyrax, also know as a Dassie, is a small, furry rodent-like mammal in its own taxonomic order, Hyracoidea. The amazingness of evolutionary time, the hyrax’s closet extant relative is the elephant! Some wonderful photos of a great place. The photo of the ridge line with the ocean and swell is fantastic!! Was the water cold?